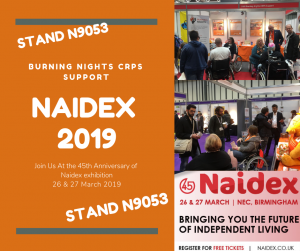 Join Us At Naidex Disability Exhibition 2019 We are delighted that for the 4th year running, Burning Nights CRPS Support charity will be exhibiting at Naidex 2019 on Stand N9053 on the 26 & 27 March 2019 at the Birmingham NEC! We’re also thrilled to announce that for the second year, we’ll be partnering with Naidex, Europe’s largest event for the disability and independent living sector! Naidex, Europe's most established event dedicated to the future of disability and independent living, is back for its 45th anniversary on the 26th & 27th of March 2019, at Birmingham’s NEC! With last year’s edition still sending ripples throughout the entire disability sector, this year’s Naidex will look to inspire, educate and motivate over 15,000 visitors by promoting the themes of active living, accessibility in the built environment, inclusion in the workplace, mental health and much more!Find 250 thrilling seminars and 350 world-class exhibitors that will offer the solutions to enable you to live more independently. Discover and test the latest innovations during brand new Live Demos that will take place throughout both days of the show. Make sure to find the perfect mobility equipment by trying it out on the Mobility Test Track and comparing it to other options. And find your next passion by getting involved in the Live Sports Arena, a feature full of adrenaline that is sure to get you active. With all this lined up, Naidex will once again become the hub of the disability sector, offering all the innovations that are improving accessibility and inclusion, as well as empowering people with a disability. Register for your FREE ticket at www.naidex.co.uk Interested in learning more about Naidex the disability exhibition or thinking about coming along to this year's Naidex 2019? Watch our great video from Naidex 2016 exhibition show.... We will be at the Naidex 2019 exhibition on STAND N9053, raising awareness of Complex Regional Pain Syndrome (CRPS) amongst not only the public but also all the healthcare professionals and students as well as amongst the legal fraternity who also exhibit at Naidex. We will be there to answer any of your questions about what support we can offer for all those affected by this debilitating chronic condition; Complex Regional Pain Syndrome (CRPS). Not only are we going to be exhibiting at Naidex 2019, our Founder and Chair of Trustees; Victoria, will also be speaking at the exhibition talking about her experiences of being a bilateral above knee amputee all due to Complex Regional Pain Syndrome (CRPS). Victoria's speech will be on 26 March 2019 at 15.30pm - 16.00pm Public Theatre 4. We hope you'll be able to come and listen to her speak! We're really excited for what is to be Naidex’s 45th and most successful year yet, and it would be great to see you there! You can find out more information and register for your ticket easily via the website . We look forward to seeing you on 26 and 27 March 2019 at what is set to be the biggest and best Naidex disability exhibition ever! 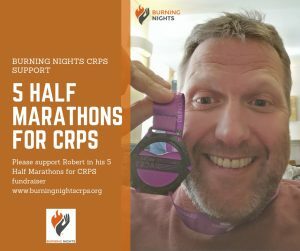 Written: 15/01/2019 Last Updated: 01/03/2019 LET'S SPREAD AWARENESS of CRPS!